I was recently invited to a Blogger event at BCharmd, a cute little jewellery boutique in Newcastle, I’d heard of the brand, but never actually visited the store so was curious to find out more. I decked myself out in a Giles Gothic Victoriana blouse, as modelled by Kendall Jenner on the LFW FW15 runway, paired it with a Year One leather skirt and Chanel boots and bag, tucked my hair into my collar and off I fled. The boutique, situated on Shakespeare Street, just South of our famous Monument, is small and cosy with a light airy feel. With a feature central island and wall fixtures, it’s easy to navigate and the great thing is, unlike so many other jewellery boutiques, the products are accessible – you can, and are actively encouraged, to pick them up and try them on. I’m greeted with champagne on arrival and introduced to the boutique owner and Creative Director, Stephanie Milburn who not only designs the jewellery herself, but also makes a lot of it in her secret workshop below the boutique. She’s actually developed and patented a sliding fastener which can be used to lengthen or shorten a necklace or bracelet to give a completely different look each time you wear it – not just a pretty face this one. It was 2009 in the coastal town of Tynemouth…. Back to the boutique itself, the cool white and grey colour scheme lets the jewellery do the talking and boy does it talk, clever lighting highlights and reflects just the right amount of sparkle and glass cabinets and mirrors are polished to perfection to create a beautiful environment in which to showcase the products. There are some great gift ideas and some great interchangeable pieces which can be mixed an matched. Shop Girl Lindsey Crawford demonstrates the twist and stack technique like a pro on a range of necklaces which can be worn in several different ways. Lindsey tells me it’s about maximising use and getting the most out of a piece of jewellery and I certainly get that. With the boutique right in the centre of town, it’s well hidden enough that you might never have heard of it, but so well placed that you can’t miss it. So if you like a bit of sparkle and you haven’t yet been then I’d urge you to check it out, the staff are friendly and approachable and the boutique has a warm atmosphere, you’re bound to find something you love in there – I know I did. Plus, you’ll be supporting local North East business and getting something relatively unique – what’s not to love? I was gifted some beautiful jewellery by Stephanie and the team at BCharmd to wear to a fashion show and couldn’t believe how many compliments I got in just that one night so huge thanks to BCharmd for surprising me with that, you guys rock! BCharmd is having a Champagne Christmas Party this weekend and you’re invited! Its an all day event on Saturday November 21st 10am – 6pm so there’s never been a more perfect time to get in and check out the cutest little jewellery store that’s right under your nose. 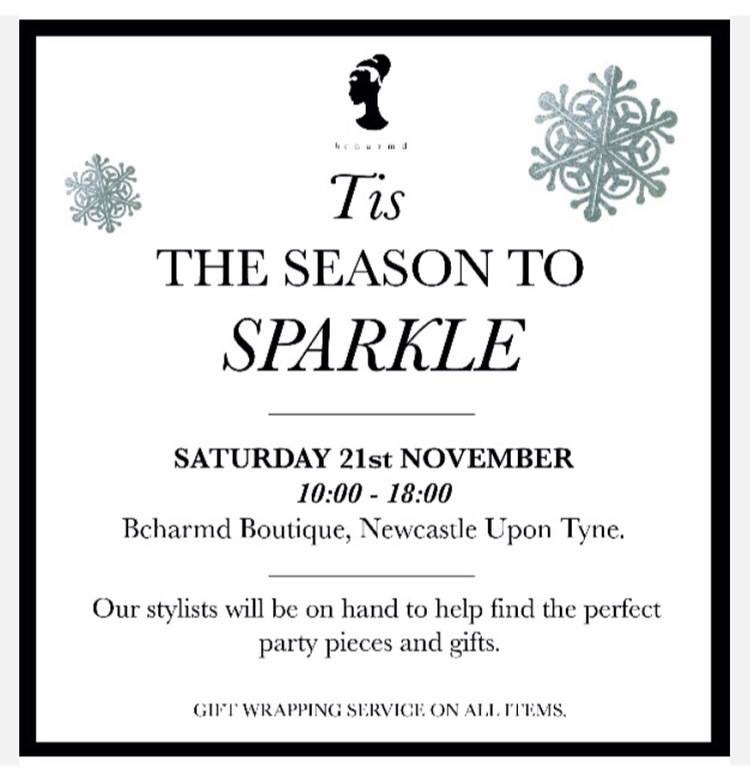 Maybe I’ll see you there this weekend, I have a big Christmas party coming up and I could do with an injection of quirky sparkle….